Tŷ Mawr Wybrnant is a house located in the Wybrnant Valley, in the community of Bro Machno, near Betws-y-Coed in Conwy County Borough, North Wales. 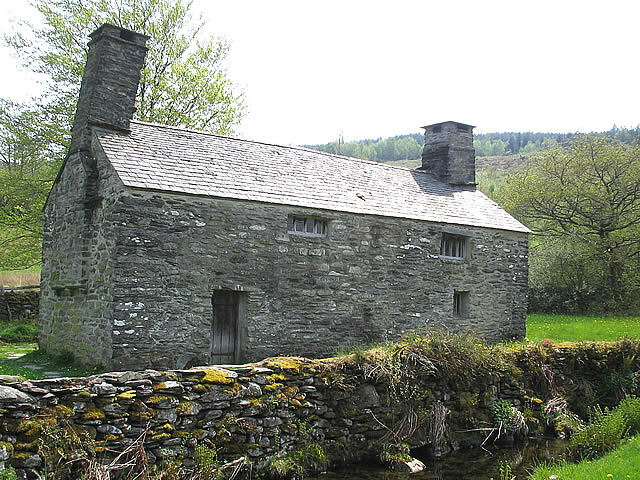 It was the birthplace of Bishop William Morgan, first translator of the whole Bible into Welsh. William Morgan was born in Tŷ Mawr Wybrnant in around 1545, the second son of John ap Morgan and Lowri, farmers and tenants of Maurice Wynn of Gwydir Castle near Llanrwst. The family must have been well thought of, as young William was sent to Gwydir Castle to be educated alongside the landlord’s children. He then went on to be educated at Cambridge, spending 10 years in study gaining his Bachelor and Master of Arts, a Bachelor of Divinity, along with an in-depth study of Greek and Hebrew – these skills would be invaluable to his mammoth task of translating the Bible. When the call came from Elizabeth I to have the Bible translated into Welsh, William Morgan set to work on this epic challenge that took 10 years to complete. It is estimated that 1000 copies of the original 1588 Bibles were printed, although today only around 20 copies survive, two of which are on display at Tŷ Mawr. The Welsh had never been able to, nor allowed to worship in their own language. Henry VIII had ordered that only English Bibles be used in Wales, and before that, all religious services had been carried out in Latin. The translation marked a very important moment in the history of the Welsh language and in the history of Christianity. After the Acts of Union in 1536, Welsh had been denied official status and had been banned from the spheres of law and administration. William Morgan's book is claimed to be the most important ever published in Welsh as it reinforced the language's status. In Tudor Britain the Bible was the cornerstone of life, the backbone of society, only text that most ordinary people would have access to. His work gave the Welsh people easy access to biblical teachings and created a standard version of written Welsh for the first time. By the following century, largely down to his translation of the Bible, Wales had one of the highest levels of popular literacy in Europe. Every Tudor house would have had a small piece of land that would have been used as the house garden, providing food crops, medicinal herbs, strewing herbs and dyeing plants to keep the household fed and healthy all year round. If you became ill in Tudor times, your first port of call would be the garden. Medicinal herbs were administered externally or internally, in a variety of forms and often with other herbs in carefully measured amounts. Some of remedies have been found by modern science to be effective, while others appeared to have worked but probably the patient recovered despite the use of the herb. Some were highly poisonous and their use may have led to many deaths. Tŷ Mawr would have been a very busy farmstead. The main living room would have had a mixture of smoke from the fire, cooking smells, animal smells, and a myriad of other, earthier smells. Before its stone floor was installed, Tŷ Mawr would probably have had a beaten earth floor painted in casein, which comes from milk, and is rather pungent when wet. People covered the floors with rushes or reeds (or woven mats of reeds or rushes), which were strewed with sweet smelling herbs such as lavender, marjoram, tansy, meadowsweet and rue. Not only did these herbs help disguise the smell, but many helped control fleas, other insects and bacteria. Dyeing herbs were used to colour fabrics. Alkanet (Anchusa officinalis) roots produce a red dye, the seed pods of woad (Isatis tinctoria) yield a blue dye and Dyer’s weld (Reseda luteola) provided a yellow dye. Culinary herbs were grown for flavouring sauces and meat and included borage, sage, thyme, rosemary, parsley and chives. The rich ate mostly a high protein diet with bread. Vegetables were a staple of the less well off. As a rule they didn’t serve them with meat like our traditional Sunday lunch, but used them in a pottage, which is a thick soup or stew, which consisted of peas, milk, egg yolks, breadcrumbs and parsley which would be flavoured with saffron and ginger. Vegetables also played a role in herbal medicine, turnips were a remedy for coughs and onions could be used to cure the bite of a mad dog (there are many cures for this condition probably due to a large number of dogs possibly with rabies). The Physicians of Myddfai rated the medicinal properties of the leek highly and devoted a section to the ‘Manifold virtues of the leek’ which include treatments for headaches, deafness, ulcers, boils, flatulence and as an aid for women who want children. Separate parking spaces, 20 yards (car park adjoining property). Adapted toilet across the bridge from the property. The grounds are partly accessible (and very pretty), with some uneven paths. The Building has a level, accessible entrance. Ground floor has uneven floors with slate flagstones. Steep wooden staircase with roped handrail to other floor. Interpretation panels within exhibition room. Seating in exhibition room. Wheelchair access is to the ground floor only. Assistance dogs are welcome. 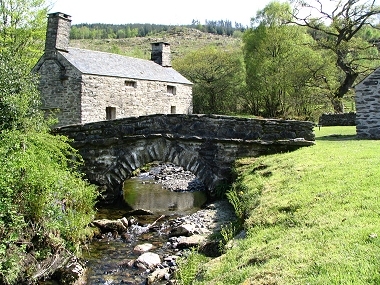 The Afon Wybrnant is the stream near which the house is located, and its name is usually appended to the house's name to distinguish it from other Tŷ Mawrs. The origins of the name Wybrnant are not wholly known. Although nant denotes a small stream and wybr is an old word for sky or cloud, some would have it that the word is derived from a corruption of gwiber, meaning "adder" or "viper". According to legend, long ago a gwiber was a huge flying snake, and one lived in this valley. Transport : Betws-y-Coed (National Rail) then bus. Bus Routes :Llanrwst to Cwm Penmachno, alight Penmachno, then 2-mile walk.